The indicator calculates the price of the trading instrument based on the RSI percentage level. The calculation is performed by Close prices, so that we can quickly find out the price, at which RSI shows the specified percentage level. This allows you to preliminarily place stop levels (Stop Loss and Take Profit) and pending orders according to significant RSI points with greater accuracy. 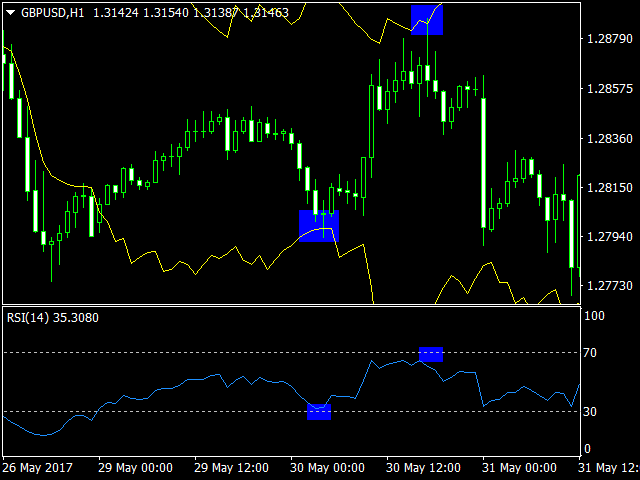 The indicator clearly shows that RSI levels constantly change, and the difference between them is not fixed. This means the standard RSI oscillator cannot help you define the number of points the price is to pass before reaching the next RSI level. For more visibility, I recommend building the levels of 30 and 70 that are the most popular for defining potential local trend reversal points. The indicator eliminates the significant disadvantage of the RSI oscillator, namely the inability to analyze level crossings and returns to the channel (roll-backs) on history. The indicator allows you to visually assess roll-backs from levels. Buffer 0 provides info on the current price level according to the RSI standard oscillator. This allows applying one indicator for the market analysis in the algorithmic trading. TF - RSI calculation timeframe. It cannot be lower than the timeframe of the chart the indicator is running on.